Well, I did it again. Saw a purse that I totally loved but kept waiting for it to go one sale and now it’s…Gone! Really Gone! So I emailed LuckyBrand asking if they had the purse anywhere. I thought it was super cool of them to respond within 24 hours. Great job Luckybrand for being responsive, polite, eager to help, and quick. Thank you so much for your inquiry. We appreciate hearing from our customers and look forward to addressing your concerns. We appreciate your interest in Lucky Brand! 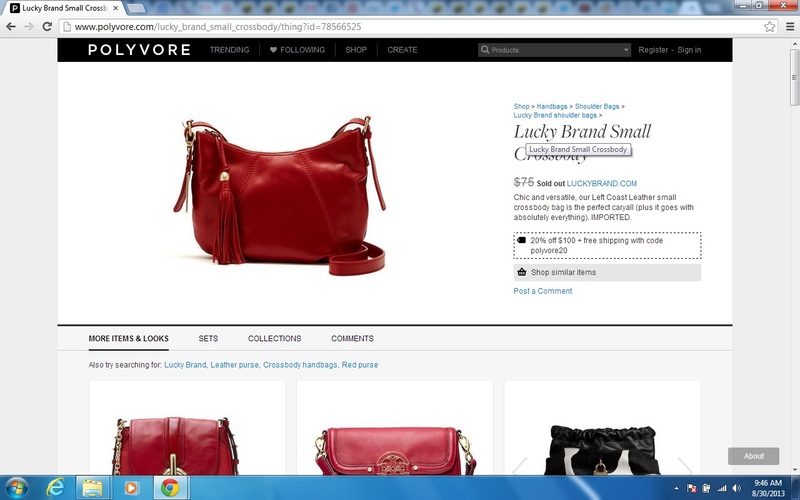 We have searched our website and was unable to locate a red crossover handbag on sale. Unfortunately, we are unable to search the store inventory without an style number. If you have the style number for the handbag, simply respond directly to this email and we would be happy to assist you with locating the handbag. Should you have any further questions or concerns, we encourage you to call us toll-free at 1-866-975-LUCK (5825) or internationally at (610) 491-2027. You may also email us at customerservice@luckybrand.com. Thank you for shopping at LuckyBrand.com!